**Note: We're doing our best to catch up on some of the films that slipped through the cracks here at the Cleveland Movie Blog. Despite being one of last year's nominees for 'Best Foreign Language Film' Oscar, WAR WITCH only played Cleveland one day, and only one showing, back in June at the Cleveland Museum of Art. Unfortunately they didn't have a screener available at that time, but the film is now available on Netflix instant and other streaming services, which is how we finally saw it. When we first meet Komona (Rachel Mwanza), the adolescent protagonist of WAR WITCH, she is recounting the story of her last few years to her unborn child. At the age of 12, Komona's small African village was invaded by rebels and she and the other village children were forced to shoot their own parents, the only other option being to watch as the rebels killed them more slowly and painfully with machetes. Once this is done the children, now having no family and nowhere to go, are absorbed into the rebels as soldiers. Komona is a survivor, and she soon finds a way to make herself useful to the rebels. When she drinks a hallucinogenic beverage, she can see ghosts who give her information about enemy soldiers. The leader of the rebels, Great Tiger (Mizinga Mwinga), hears of this and recruits Komona to be his new “war witch”. Considering that Tiger has killed his previous war witches when their powers failed them, it's not necessarily that great a promotion. The only bright spot in Komona's nightmarish existence is a young albino rebel named Magician (Serge Kanyinda). When an opportunity presents itself for the two friends to escape the rebels, they do so, but their troubles are far from over. Most of the film's horrors take place just out of camera view, but they are no less disturbing for being suggested rather than shown. And even in the film's most idyllic stretches, we're always aware of the guilt Komona is dealing with, and her inner doubts that she can ever be a good mother. 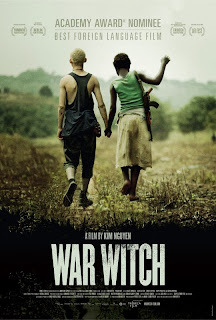 WAR WITCH is rough going at times, and yet despite all the darkness and despair endured by its heroine, it still manages to suggest there is hope. At times it's even funny, and there's a streak of poetic fantasy running through it as well in touches like its simple but effective depiction of the ghosts that Komona sees. However hopeful it may be in the end, WAR WITCH is undeniably rough going in a lot of spots. It also serves as an uncomfortable reminder that stories like Komona's are far from uncommon in the real world. It's a powerful film that will make you feel sad and angry at times. But it's also, dare I say, an entertaining film. Not in the facile way of some Hollywood action flick, but in a real, substantive way. Since it wasn't released in the U.S. outside of a few festivals until this year, I'm counting it as a 2013 release, and as such it's one of the year's best. 4 out of 4 stars.